Want to Suss Out Your Compatibility? Look to the Elements. Here’s How. Looking for love? Virginia Mason, of Fleeting Connections, (and Horoscope.com’s weekend love horoscope writer!) shares how the elements play a crucial part in us finding (and keeping) love. Here, how they work and how to find the element balance you share with your partner or potential partner. — Horoscope.com editors. 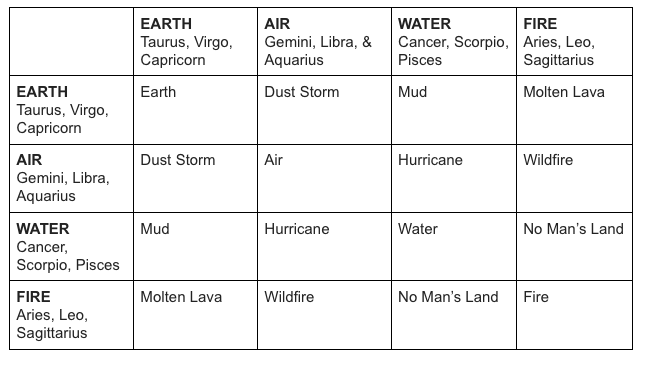 The 12 Zodiac signs embody variations of the same four elements: earth, air, water, and fire. Knowing what the elements mean and how they interact is essential for understanding how you and your lover relate. In fact, it’s the key to understanding all astrological compatibility and helping you navigate conflict. So consider this your compatibility cheat sheet. Earth signs include Taurus, Virgo, and Capricorn. People born under these signs predominantly experience the world through the five physical senses (sight, sound, taste, smell, and touch). For them, life is of this earth. It’s about practical, material reality. Air signs include Gemini, Libra, and Aquarius. People born under these signs predominantly experience the world through their minds. For them, life makes sense through thoughts and analytical processing. They want the world to make sense and love to talk about ideas. Water signs include Cancer, Scorpio, and Pisces. People born under these signs predominantly experience the world through emotion and intuition. For them, practical reality is a nuisance and thoughts are distracting. Life is about feeling, and they often have one foot in another realm. Fire signs include Aries, Leo, and Sagittarius. People born under these signs predominantly experience the world through actively doing things. They’re all about keeping things moving, and just like fire, they’re experts at creating and destroying things. When two earth signs come together, they form even more earth. The relationship is ruled by practical concerns and sensual experiences. They understand each other, and the relationship feels incredibly secure and supportive, but it also may lack the excitement and growth that comes from having a partner whose worldview challenges your own. Air stimulate earth’s creative thinking, and earth helps air get out of their head. They challenge each other in a productive way, but the relationship risks become exhausting. Earth doesn’t enjoy getting all caught up in thoughts and long talks. At the same time, air needs mental excitement and conversation and may find earth’s taciturn nature frustrating. Earth and water give each other stability, and like mud, their bond is strong. Water needs earth in order to address practical concerns and get things done, and earth needs water in order to connect to their emotional depths. The earth person is very much the water person’s rock, which water needs given all of its intense feelings. You see the world from opposite ends, but if you can appreciate how this expands your awareness, then this combination has real staying power. Fire heats up earth, exciting the earth person both sexually and in terms of productivity. With a fire person by their side, earth has the power to accomplish a lot. And the same goes for the fire person. Fire is a powerful doer but has the tendency to get ahead of itself. Earth slows fire down and helps them successfully execute. Like molten lava, they get each other moving, and if they can respect each other’s boundaries (and the fire person doesn’t steamroll the earth), then this combination has the potential to solidify and last a lifetime. Air and water can float up like mist or grow volatile like a hurricane. Either way, this combination struggles to stay together. Water brings feeling to air. Air brings intellectualism to water. They love and enjoy each other. The beginning is often fun and passionate. But air struggles to understand water, and water grows impatient with air’s insensitivity. This combination creates a revolution in their lives, leaving them both deeply changed, but often, water has to cycle back down to earth while air moves along. Fire is ready to get things done, and air is full of ideas. Together, they are a powerful, unstoppable force of activity. Air’s ideas excite fire, and air loves watching fire manifest everything they’re imagining. But this combination is sensitive and can get out of control if not kept in check. Air has the ability to fuel fire, but it can also blow it out. The fire person can burn out by being overstimulated or by feeling trapped in conversation. Boundaries are important. Two water signs have a deep appreciation for each other’s emotional sensitivity. They are both deeply compassionate and spiritually inclined, but in order for this relationship to work, there needs to be plenty of space! Space to feel, and space to be. Water plus water creates more water, so you better make sure you create a container big enough to hold all of that. Otherwise, the water can spill over and become destructive. For this to work, both people need to be firmly grounded in themselves and the earth. Fire and water tempt each other, but they will quickly feel like they’ve entered enemy territory. Fire gets water boiling, and water signs are intensely sexually attracted to fire. The passion here is incredible, but it’s also unsustainable. With that much heat, water eventually boils over. On the other side of the relationship, water cools fire and extinguishes its passion. The attraction here is magnetic, but often, the fire person will feel smothered and want distance while the water person is left wondering what happened to all of the early passion. Two fire signs are ready to go out into the world and adventure! This relationship is passionate and exciting, but it can lack direction and purpose. You may find yourself doing a lot of fun things, but in the end, you probably won’t have accomplished a lot other than simply experiencing. And for you, fire sign, that may very well be enough! What is life but one big experience? You both understand this. You fuel each other, and if you can decide on a mutual course of action, you’ll be forging a path together in no time. 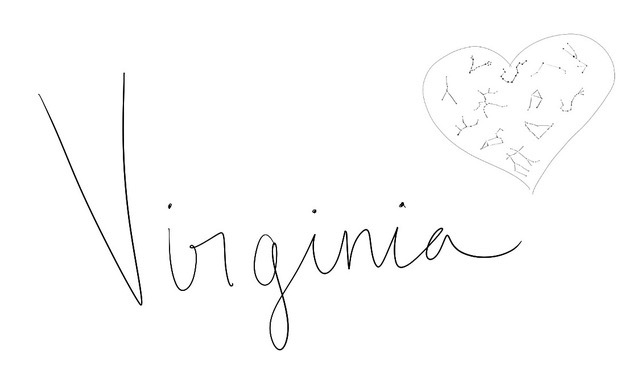 Virginia is a Brooklyn-based Reiki Master and psychic healer dedicated to expanding people’s understanding of what’s possible. She offers private readings, coaching, healing, and more through her company, Fleeting Connections. Follow her @fleetingconnections on IG! 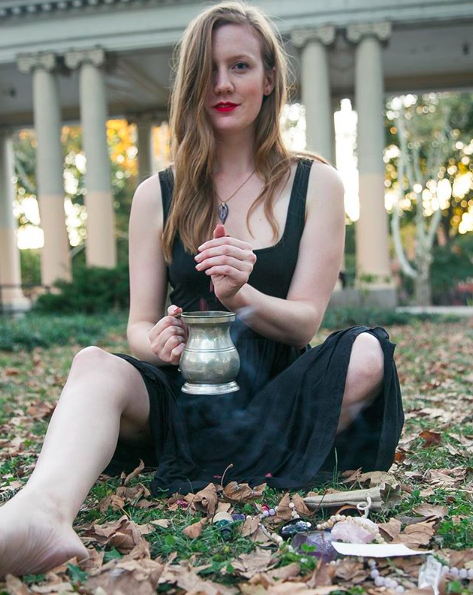 Embed photo of Virginia Mason from her feed, @fleetingconnections, on IG.